Ragnarok M: Eternal Love is the mobile version of the popular PC MMORPG game Ragnarok Online. The Ragnarok Mobile version (ROM) launched in Southeast Asia on October 31, 2018 and it immediately garnered many players especially old Ragnarok players. But there are also new players or we usually known as newbie who played the game but they don't know where to start. So if you are a newbie or beginner, reading this Ragnarok Mobile leveling guide will help you level up fast easily. 1. Easy control function - you can familiarize the controls quickly, as it resembles the d-pad controller. 2. Stamina-based - Everyday you will receive 300 minutes of battle stamina or also known as combat time. Reaching yellow and red stamina will decrease drop chance rate as well as EXP rate. 3. Job Switch Function - Your character can switch through alternate jobs with zeny or unlock other job routes by using Big Cat Coins. (a) Zeny Top Up, Premium Card (VIP), Big Cat Coin and BCC Shop. Before fatigue used up, normal monster in map EXP and drop rate increase by 33%. Base EXP from battle increase by 5%. Job EXP from battle increase by 5%. Receive current month headgear fashion for free. Auto battle slot increase by 1. Unlimited usage count for Lightning Chain. Receive double gift from pet when pet give you gift. No level limit on tools taken out from shared storage. Receive 1 free B grade food from Food Merchant daily. Buy 1 food with half price. Kafra has more teleport location. MINI isu appear at MVP interface. VIP Card can be traded in Market. VIP Card lasts for 31 days. 6. War of Emperium (WoE) and War of Crystals (WoC) - this is a guild war, with a mission of conquering a Castle to be the headquarters for the guild, and get benefits and special advantages. This is the most enjoyable part of the game. Characters in 1 map can exceed to 200+, so having a good spec phone is a plus. 7. Cooking System - You level up your cooking skills and unlock higher level of foods. Gourmets will boost your stats once you consume it. 8. Rune Grid - Once you unlock it, focus on it first as it boost your stats and some skills' power using Guild Medals and Gold Badges. 9. Cat Mercenaries - these cats can be your companion when you hire them, and each cat has its own ability (healing, damage and defense). 10. You can achieve high damage - especially in late game. Most players can 1v1 MVP bosses, some can do 1 hit. 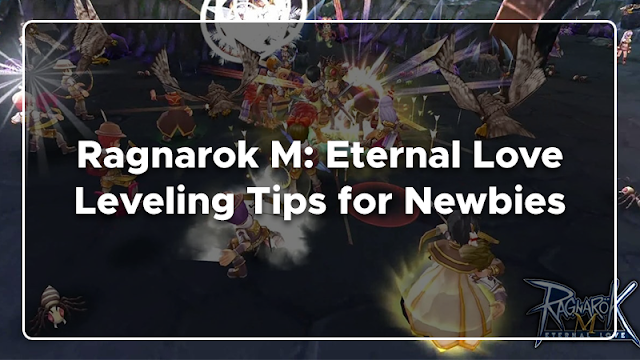 The following Ragnarok Eternal Love guide will help you level up fast and familiarize the game mechanics. 1. Prioritize Quests - in order to level up faster, prioritize doing quest. However, don't just take all the quest available. Prioritize the ones with the red exclamation point as those are your Main Quests especially when you first create a character, just follow the red quest and you'll be set until your job changed at level 10. In addition, you can also do a daily Mission Board Quests. The mission board can be found in every major city. There are a 10 available quests daily which refreshes every 6:00 AM (GMT+8 Philippines Time). Also take note of the Minstrel Quests. The Prontera Minstrel can be found in the west area of Prontera, the Minstrel will ask you to get him items and kill monsters in exchange for EXP, zeny and items. Finally at level 22, the Monster Resistance Quests will become available. You can get it from the Messenger Monster Watcher NPC near the mission board. With this quest, you will get 10x EXP from killing monsters up until a certain amount. Note that the quest can be stackable up to 6 times which means players can stack up to three days worth of exp threshold. 2. Create a party - whether you're playing with friends or have met some new ones in-game. Having a party will greatly lessen the time needed to complete certain quests and will help boost leveling up. To create a party, just tap/click on a friend in your friends lists and invite them to join the party. Remember, you have to be on the same channel to be in a party. You can check your current channel in the upper right corner of your screen, if you're not in the same channel you can change your channel in Izlude. At first, you have to walk to Izlude as it's not initially available in the Kafra teleport when you first start in the game. Izlude is located southeast of Prontera. And once you are in Izlude, go to the channel teleporter and input your desired channel number. Once in a party, you share experience and loot, but more importantly you can help each other a lot in quest. Tip, you can click follow if you have a party leader that you want to follow around the map. If Auto Attack is enabled you will also attack the monster they're attacking. 3. Use Auto-Attack setting - In Ragnarok mobile, you don't have to manually attack each monster compared to PC version Ragnarok Online wherein you have to click and attack each monster which can get very tiring and grinding, resorting for some players to use bots just to automate the attacks. Thankfully in mobile version, there's no need for bots, the Auto-Attack setting is already part of the game. To set up the Auto-Attack setting, just click the 'Auto' button in the lower portion of the screen and select a monster you'd like to target. Furthermore, you can customize your Auto-Attack skills, just go to 'More' sajian in the upper right part of the screen, select 'Skills', and long press and drag the skills you would like to use into Auto skill slot. 4. Level Up your Skills and Attributes - for every job level you gain, you get a skill point which you can use to level up skills. Just go to 'More' sajian then Skills, now you can select the skill you would like to level up. Generally, the next level of a certain skill will have better stats or would deal more damage. Aside from skills, you can also get attribute points every time you level up. To view the attributes, click your photo then click the second tab. There are six attributes to level up: Strength, Agility, Vitality, Intelligence, Dexterity and Luck. As a newbie tip, you can follow recommended 'Builds' of the job that you have, just click on 'Builds' then you can select from the different build presets. This will give you an idea which attributes are best for your job. Don't worry about experimenting at this point because you will get a reset item once you change to your second job, by then you would have more experience and knowledge about your job class, and would be more serious and careful in making your perfect build. 5. Warping - teleport from one place to another. You currently have three choices for teleport or transport. (1) Avail of Kafra services, just go to your nearest 'Kafra Staff' NPC which is usually around major cities (in the map, find the headband logo). The Kafra can teleport you to places you already visited and saved, so make sure to talk to the Kafra or Ariel to save your location for each new place you visit. The Kafra can also save your warp point - by selecting 'Saving Service'. (2) Upon saving your warp point, you can use the Butterfly Wing item to transport to that saved point. So even if you are in a different map, you can always go back to the city warp point using the Butterfly Wing. (3) You can also use the Fly Wing. The Fly wing will teleport you to a random section of the map. Some people use this as a farming tool to find monsters in other sections of the map, while others use it to quickly navigate the map but then again this is random, so if you want to go to a certain spot it's all just luck. Both the Fly Wing and the Butterfly Wing can be bought from the Item Shop. Also, you can put the Fly wing or any other consumable items in the quick access kafe by opening your bag then the arrow at the bottom right, you can then drag or rearrange the items in the quick access bar. 6. Trading and Exchange - this is the transfer of item from one person to another. In this mobile version, there's no direct player to player trade, unlike in PC version. Only merchants can sell using their shops. However, there is an Exchange Function in the game. You can find the Exchange NPC near the mission board. Here you can sell your loots or buy items from other players. You cannot set a price, it will automatically be determined by the system. If you buy an item, check the Trade history to claim it. If you need a certain loot, it's an option to check the market for it. 7. Item Storage - to store your items, go to the nearest Kafra and select Stash Service. It will cost you 99 zeny to unlock each time, you can then drag the items from your backpack to the storage. Note that you can also share your stash to other characters within your account but you have to be level 40 before you can use the shared stash. 8. Eat some Warm Dish - some quests will give out the Warm Dish item. This will automatically regen a set amount of HP and SP. You can check the remaining amounts at the upper left side of the screen below your photo. This is very helpful especially when you are farming as you don't have to spam tap potions. You can purchase this from the Food Shop for 5000 zeny. 9. Maximize the Combat Time - you have to be mindful of your Combat Time. You can check your combat time under 'More' sajian then Game Settings. Every day you will get 300 minutes of Combat Time. If you exceed the 300 minutes, the EXP and item drop rate will become lower. However, you can increase your daily Combat Time by 60 minutes everyday if you listen to music at the Prontera South Field. You can check the additional Combat Time in the Settings. Also, if you want to increase experience and drop rate, you can use the Lightning Chain. However, it will also consume Combat Time much faster. In order to maximize your experience when farming always be mindful of your remaining Combat Time. 10. Take screenshots of unique landmarks and monsters - to take screenshot, there's a camera under 'More' sajian in the upper right corner of the screen. As you go along different maps, make it a habit to take photos of unique landmarks and monsters, the reason is that these photos will count towards your Adventure Book level. Every time your adventurer title is promoted, attributes will be greatly improved and new adventure skills will be unlocked. How do you find this Ragnarok Mobile fast leveling tips? You can also share us your leveling tricks, just leave your comment below.